Maryland’s Intercounty Connector (ICC) Project Wildlife Passage is a wildlife connectivity effort aimed at protecting Maryland’s deer, small mammals, and fish that frequently travel across the recently-established 18-mile ICC, a corridor that connects the State’s Montgomery and Prince George’s counties. In 2011, the Maryland State Highway Administration opened the ICC to traffic from Interstates 270 and 370 to Interstate 95. Photo credit: Maryland State Highway Administration. Figure 1. 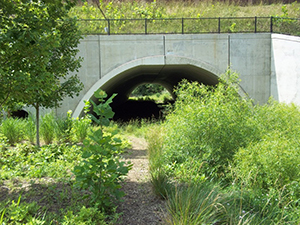 The ICC Wildlife Passage Project incorporates wildlife and stream culverts like this bottomless arch culvert. Photo credit: Maryland State Highway Administration. Figure 2. A deer escape ramp shortens the height of the fence on the roadway side. From the project’s inception, effective wildlife passage has served as an important theme. Project planners identified comprehensive wildlife passage as a primary focus for the project, especially as the 18 miles of the ICC traverse multiple forested stream valleys. The project’s Interagency Working Group, which includes a representative from each participating regulatory agency, resource agency and project stakeholder, planned for wildlife passage at all major (and some minor) stream crossings along the ICC and for the use of right-of-way fencing and sound walls to direct wildlife to these crossings and limit their access to the roadway. The ICC project incorporates many elements to support effective wildlife crossings. 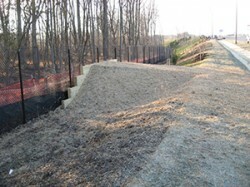 The project’s final design includes many upgrades such as chain link fencing along the corridor to exclude deer from the highway; wire mesh fences to prevent smaller animals from burrowing under the fencing or climbing over it; “escape ramps” along the inside of the fencing to guide deer back into the forested areas in the event they access the ICC; and culverts, “bottomless arches,” and bridges that span both streams and the area’s entire 100-year floodplain. Since constructing the wildlife passages, the ICC environmental team has documented heavy use of all of the passages by visual observation and by observation of prints within the culverts. Wildlife users include deer, raccoons, opossums, squirrels, turtles, foxes, and horses. Post-construction monitoring of the bottomless arches indicates that efforts to support fish populations and passage have been successful. The regular use of the wildlife passages, including the bridges, culverts and deer escape ramps, and the relatively low rate of post-project deer/vehicle collisions along the ICC help to demonstrate the success of the project’s wildlife connectivity elements. For more information, contact Robert E. Shreeve, Maryland State Highway Administration, at RShreeve@sha.state.md.us.